The 29t o August is the 241st day o the year (242nt in lowp years) in the Gregorian Calendar, wi 124 days bidin. 708 - Copper coins are mintit for the first time in Japan. 1484 - Pape Innocent VIII is electit Pape. 1728 - Nuuk, caipital o Greenland, is foondit. 1741 - A volcanic eruption on Oshima Island, Japan, causes tsunamis in the Sea o Japan, which kill 1,600 fowk. 1756 - Frederick the Great attacks Saxony at the stairt o the Seiven Years' War. 1782 - The ship HMS Royal George sinks while anchored in the Solent, aff the Sooth coast o Ingland, killin 800 tae 950 fowk. 1825 - Portugal recognises Brazil's unthirldom. 1907 - The Quebec Brig ower the Saunt Lawrence River collapses. 1914 - Warld War I: New Zealand troops land in then-German Samoa. 1930 - The last-remainin residents o St. Kilda, Scotland are voluntarily evacuatit tae the mainland. 1941 - Warld War II: Tallinn, Estonie, is occupied bi Germany. 1944 - Warld War II: Slovak troops rise against their Nazi rulers. 1949 - The Soviet Union tests its first atomic bomb in Semipalatinsk, Kazakhstan. 1950 - Korean War: Breetish troops arrive in Korea. 1965 - The Gemini V spacecraft returns tae the Yird. 1996 - A Vnukovo Airlines Tupolev Tu-154 crashes intae a muntain in Svalbard, killin 141 fowk. 1999 - East Timor votes for unthirldom frae Indonesie. 2003 - A car bomb attack in Najaf, Iraq, kills ower 100 fowk. 2004 - The 2004 Simmer Olympics in Athens end. 2005 - Hurricane Katrina hits the Unitit States coast o the Gulf o Mexico (Louisiana, Mississippi an Alabama) an in particular New Orleans, killin ower 1,000 fowk. 2008 - John McCain, US candidate for Preses, nominates Sarah Palin as his runnin mate. 2012 - The Simmer Paralympics in Lunnon stairt. 2017 - North Korea fires a ballistic missile ower the Japanese isle o Hokkaido. 2017 - Kezia Dugdale propales her demission as leader o the Scots Labour Pairty. 2018 - Alex Salmond, umwhile First Meenister o Scotland, propales his demission as a member o the Scots Naitional Pairty, ower the emergence o sexual harrassment allegations. 1619 - Jean Baptiste Colbert, French politeecian (d. 1683). 1632 - John Locke, Inglis filosofer (d. 1704). 1749 - Gilbert Blane, Scots medicinar (d. 1834). 1780 - Jean-Auguste-Dominique Ingres, French penter (d. 1867). 1862 - Andrew Fisher, Scots-born 5t Prime Meenister o Australie (d. 1928). 1862 - Maurice Maeterlinck, Belgian screiver (d. 1949). 1871 - Albert Lebrun, Preses o Fraunce (d. 1950). 1913 - Jan Ekier, Pols pianist an componer (d. 2014). 1915 - Ingrid Bergman, Swadish actress (d. 1982). 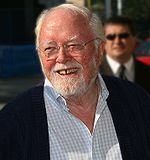 1923 - Richard Attenborough, Inglis actor an director (d. 2014). 1936 - John McCain, American politeecian (d. 2018). 1940 - James Brady, White House Press Secretar (d. 2014). 1943 - Arthur B. McDonald, Canadian astropheesicist. 1946 - Demetris Christofias, 6t Preses o Cyprus. 1947 - James Hunt, Inglis racin driver (d. 1993). 1947 - Temple Grandin, American zoologist an professor. 1958 - Michael Jackson, American sangster-sangwriter, producer, dancer an actor (d. 2009). 1959 - Eddi Reader, Scots sangster. 1963 - Steve Clarke, Scots fitbawer an manager. 1967 - Neil Gorsuch, American judge. 1986 - Lea Michele, American actress an sangster. Wikimedia Commons haes media relatit tae 29 August. This page wis last eeditit on 31 August 2018, at 22:02.